This book is very weird, ferocious, passionate, funny and heart wrenching, all these adjectives and more come to mind while reading "The Vanishers." Heidi Julavits's strange novel manages to be a surrealistic psychic noir mystery, a satire of academia and modern medicine, while simultaneously exploring female relationships -- mother to daughter, teacher to student, friend to friend, enemy to enemy -- with an intensity that humor can only mask for so long. As odd as all this sounds, it is also eminently readable. As the book opens, the narrator, Julia Severn is a student of the psychic sciences at the Institute of Paranormal Psychology, also known as The Workshop. Her mentor, the powerful Madame Ackermann, hired Julia to transcribe her regression travels, but has been unable to produce results. While Madame Ackermann sleeps Julia has, without her employer's knowledge, tried to cover for her by making up transcripts of their sessions. Madame Ackermann tumbles to the trick and in retribution launches a psychic attack on Julia that ruins her health and forces her to leave the workshop. After retreating to New York and a mindless job, Julia is approached by a pair of researchers who are seeking a once famous artist and offer Julia treatment in return for using her psychic powers to their advantage. Julia hopes the quest will lead her closer to her mother who committed suicide when she was a month old. As expected, nothing turns out to be what Julia expects. Who is attacking whom? Who is seeking whom? Where is the border between sanity and insanity? The twists and turns of the plot are complicated by characters who refuse to remain anchored in time and space, life or death and will leave you gasping at the imagination that dreamed up this manic chase. 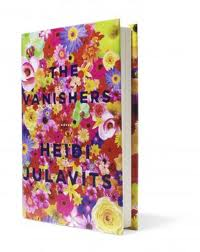 Despite the frenetic forward movement of the story, at its heart, "The Vanishers" is a bildungsroman about dealing with grief and loss, especially when the void is created by suicide or disappearance. If you get to the end and are left with questions, don't worry, that is Julavits' point. Ambiguity is an essential component of the human condition and learning to live means learning to live with seemingly contradictory impulses governing our relationships. It is a book worth reading and, in my opinion, rereading.